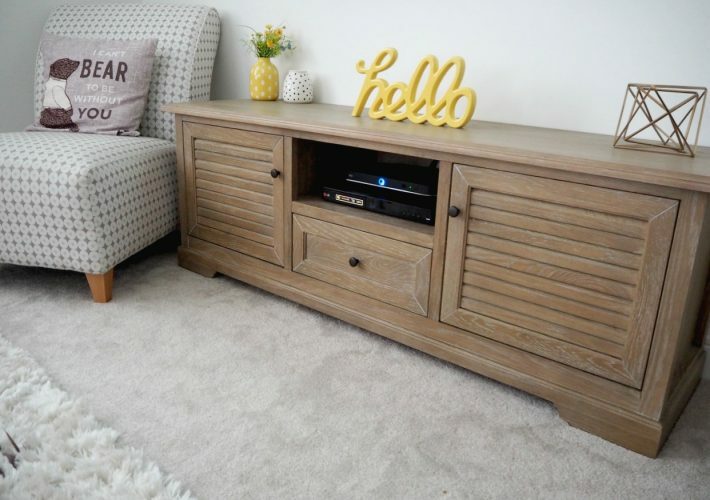 My mission to transform our unloved playroom into a cosy snug, is finally complete (bar the addition of a new sofa bed) so I thought I would share it with you. The part we haven’t quite agreed on yet, is the name. My sassy teenage daughters have decided that their uncool mother is forcing the term ‘snug’ so it’s currently up for discussion. So far I’ve had suggestions of TV room, family room, den and the slightly less complicated…’new room’. Any more ideas gratefully received! 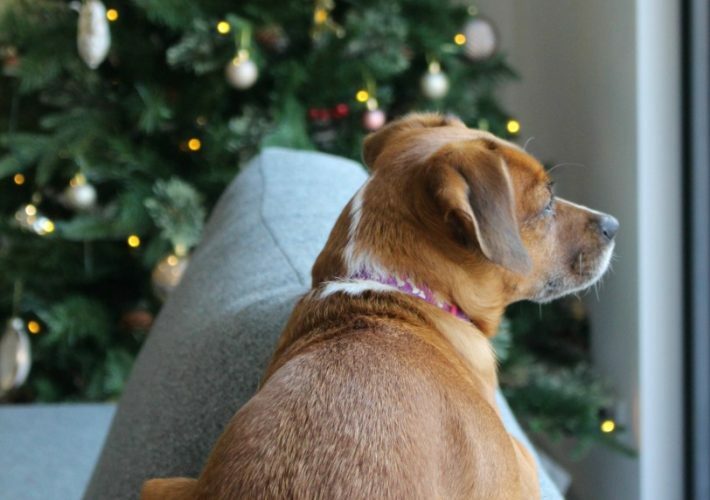 As you may well know by now, I’m a tad nervous about making decorating decisions and the choice out there these days does not help in the slightest. 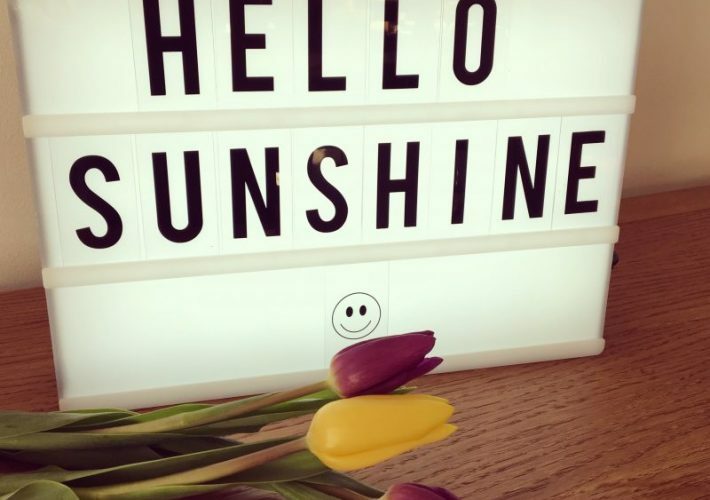 In the last year, we’ve decorated three rooms in our house and before embarking on anything, I’ve taken to creating a Pinterest board with the aim of gathering ideas. I cannot recommend this highly enough. For those still in the last century, think online mood board. For the first three weeks, my mood board consisted of rugs. Just rugs! I knew that I wanted to feature monochrome as well as mustard yellow somewhere in the room so managed to waste spend hours trawling through various sites looking for The Perfect Rug. 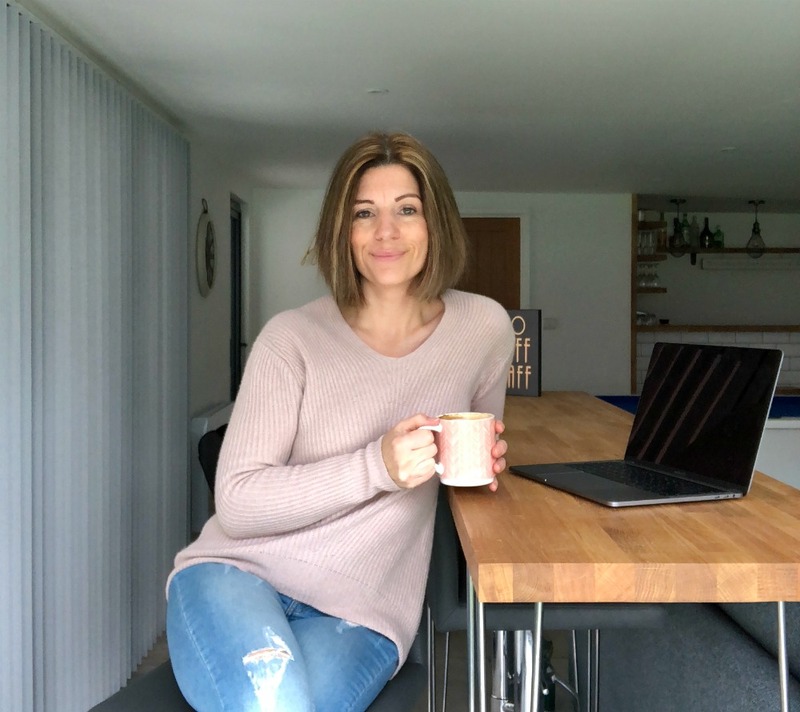 I have to say that it paid off because I was thrilled with my La Redoute purchase when it arrived and I even managed to bag 25% off in their January sale. Whoever knew there were so many different shades of grey? 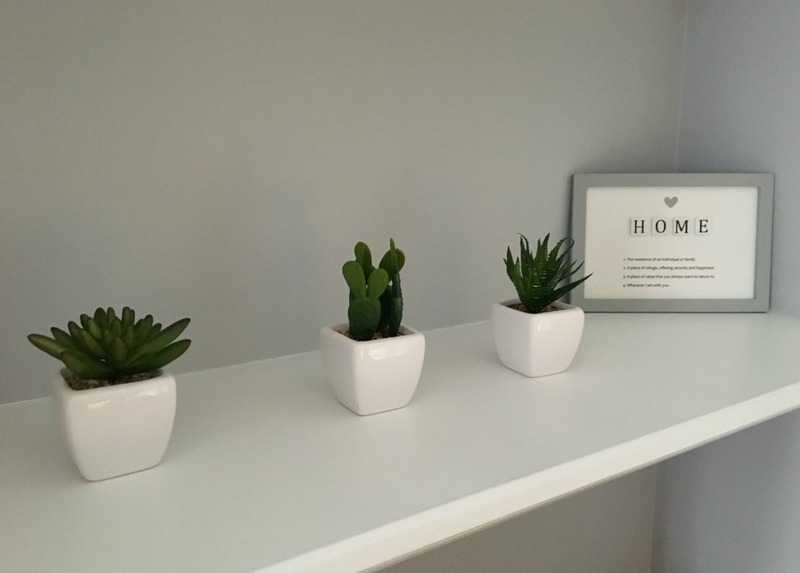 With the danger of being labelled boring, we’ve used the same shade of grey in three different rooms – Feather Flock by Dulux. Having tried MANY, this one is a soft, warm grey that works well in most lights although does look very different in every room. 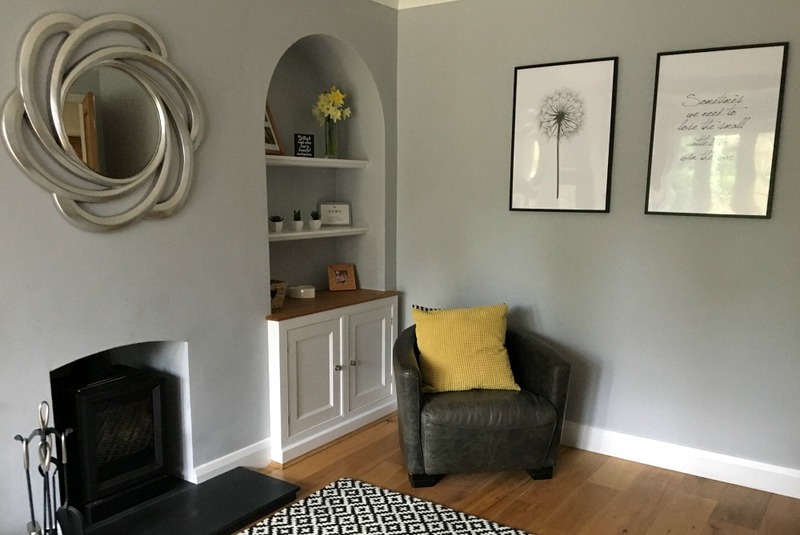 I toyed with the idea of painting the cupboards a darker grey but I am pleased that in the end, we opted to stick with white on the cupboard doors as it gives the room a fresher feel. I think one of the main things I learnt in the process, is that you don’t need to spend a lot on accessories if you hunt around. Probably my most expensive purchase was the rug but even that, once it had the 25% off, was only £143. The cushions were from Ikea and we all know what a bargain that place is! 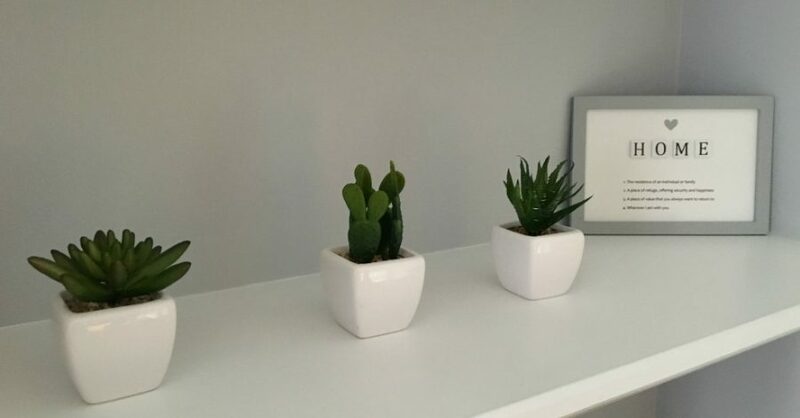 I made my first visit to Wayfair’s website, where I bought the stylish chrome mirror that I’ve been asked about time and time again on social media, as well as the (fake) succulents. I am officially the world’s worst plant owner, killing everything off within a week, so these were a great compromise. It’s not exactly a ‘touch’ but our wood burning stove is the best! We always had this big gaping hole where a fire used to be but the chimney had been boarded up. 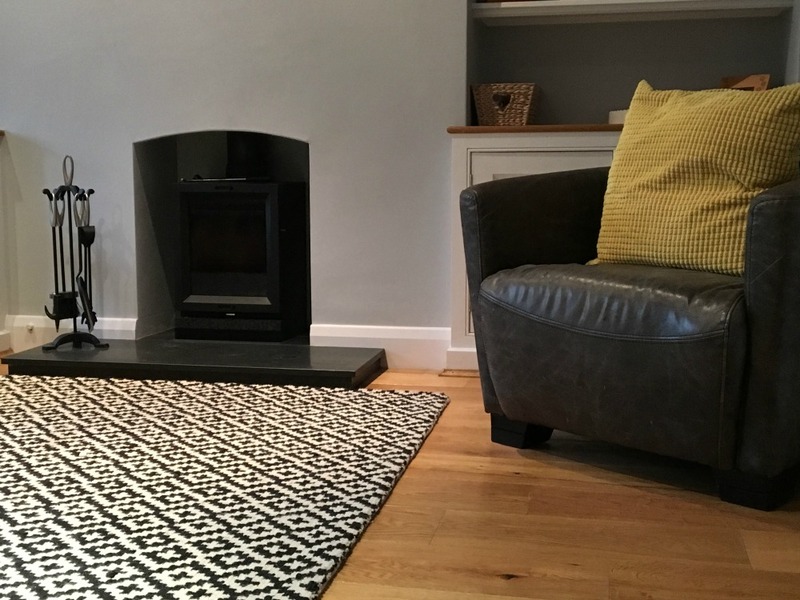 I knew that we would never light an open fire but a wood burning stove is an excellent alternative and as the room is quite small, this diddy one (Stovax View 3 Multifuel stove for anyone who is interested) is perfect for the space and doesn’t whack out too much heat. No room is complete without a picture wall now, is it? I’ve gone for a complete mismatch of frames here and I think it brightens up the room adding a much-needed personal touch to it. I also managed to please my husband by not banging any nails into the walls. If you haven’t tried them before, Command Strips are the greatest invention of all time! My final decision, is choosing a new sofa. With 5 different people in the house (and thus 5 different opinions) it seems to be a tall order. We are looking for a cosy sofa that isn’t leather, doesn’t require daily plumping and is comfortable to use as an occasional guest bed. In our experience, sofa beds are a difficult item to get right – do you go for sofa first and bed second? We are currently considering a few options, all of these are from Sofa Sofa and are possible contenders. Obviously we will be choosing dark grey as a colour – ‘if it ain’t broke’ and all that! Disclosure: This post was written in collaboration with Sofa Sofa but all opinions and words are my own. I like “den” for a name. New room is not going to work for ever. We tried that with our extension in Tiree but it is eight years old now. We just call that the Day Room because there is no fire there for the evenings. Won’t work with yours. Chuffed to see we feature on your picture wall. The room looks lovely. We got a La Redoute rug and were v pleased with it. Their sales are genuine bargains. It looks amazing Suzanne! I think sung is perfect! How fun to have this cosy little space to hideaway in. And I have never heard of those no jail things but now totally checking them out!!! Predictive text! ? Sung = snug! It looks fabulous! No idea what to call it, no doubt a name will just emerge of its own accord at some point. The picture wall looks great. My husband has just agreed to one, which I was gobsmacked about as he always moans about having too many pictures up! I will remember Command Strips, thanks for the recommendation! Oh, and when it comes to the sofa bed, I would go sofa first, bed second! It’s not like anyone is going to have to sleep on it for more than one night at at time, but people will be sitting on it all the time. 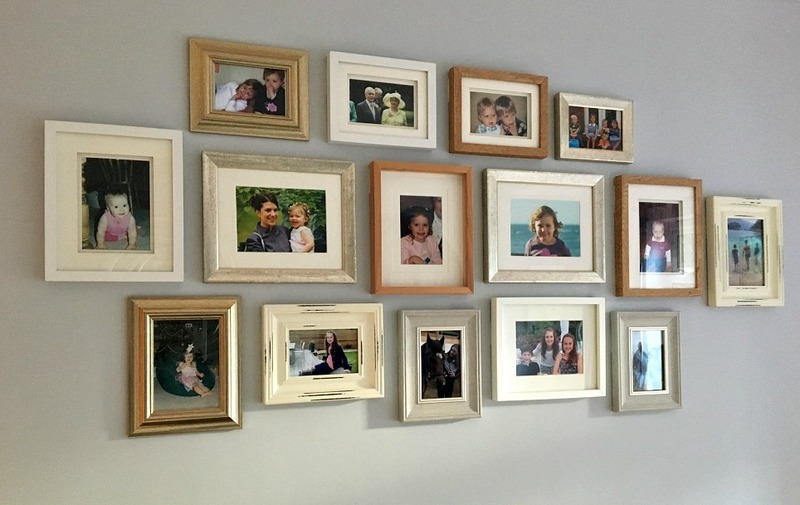 I’ve always loved grey and yellow together, and your gallery wall of family photos is adorable. I really need to get some photos up in my place! Great room! 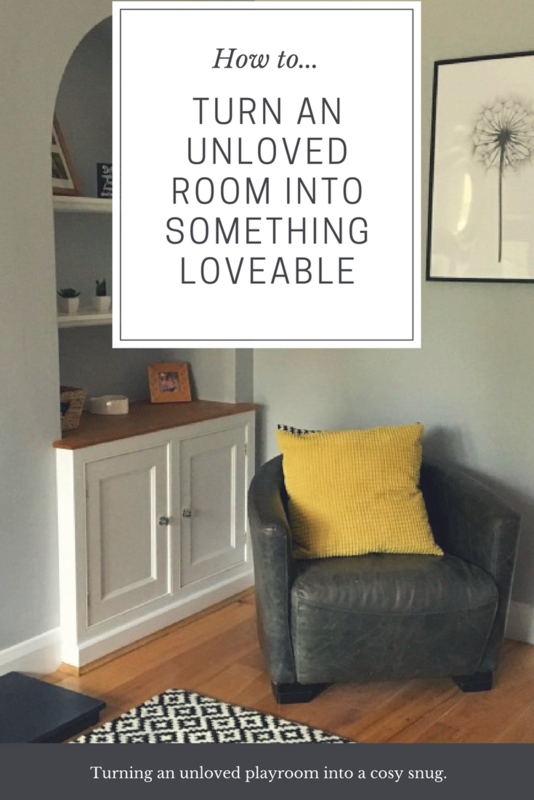 I love the alcove with cupboards (I think this is because our house has no such quirky things, just straight plain walls) Definitely choose comfy sofa over bed – unless you’re planning on using it for a relative or (adult) friend who visits frequently. I rather wish I had a place like this for my visitors – currently they choose from a mix of blow up and fold out camping beds,but they’re young, so can survive. It looks brilliant, Suzanne. And monochrome and mustard is such a fab combination, particularly with that lovely shade of grey on the wall. 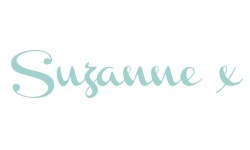 I love the paint colour Suzanne, I think i’ll try it on a wall in our hallway when we decorate soon. We turned our playroom into sitting room, it’s so cosy and the style is more modern than our main lounge, we have a plain teal rug but I prefer your patterned one. 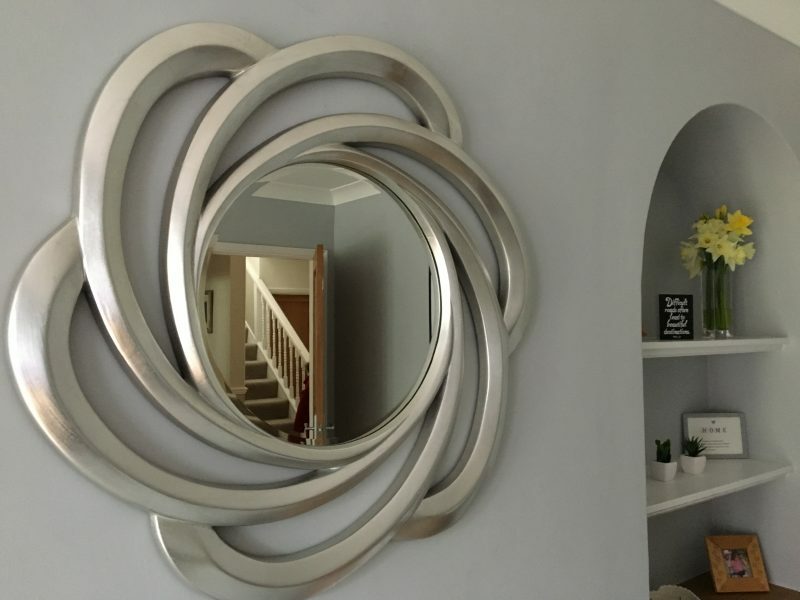 That mirror – wow! It really stands out. Good luck settling on a name for the room. My dad renovated a shed into a holiday home and we all still just call it “the shed” which he hates us doing, especially since he did such a good job on it. You’d better put your foot down and insist on the name of your choice.